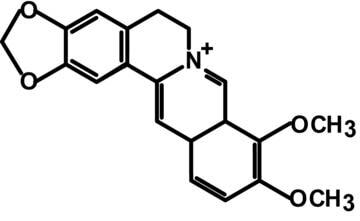 Berberine is an Isoquinoline Alkaloid, Quaternary Ammonium Salt, (C20H18NO4+); a natural chemical compound that is found in several plants. The plants that contain berberine are Berberis aristata (tree turmeric), Berberis aquifolium (Oregon grape), Berberis vulgaris (barberry), Phellodendron amurense (Amur cork tree), Xanthorhiza simplicissima (yellowroot), Tinospora cordifolia, Eschscholzia californica (Californian poppy) and Argemone mexicana (prickly poppy). 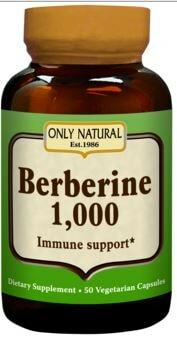 Berberine supplement is usually extracted from the stem, roots, rhizomes and bark of a plant. It is known to have anti-bacterial, anti-diabetic and anti-inflammatory effects. The first recorded use of Berberine was from the ancient Chinese people, who were using it as a broad spectrum anti-microbial. Based on recent studies, researchers found out that Berberine is a supplement that has multiple effects on various conditions such as; infection, diabetes mellitus, hypertension, and other diseases. Berberine is also recognized as a miracle drug, due to its multiple effects over illness and diseases. It is also recognized as the next big thing in anti-aging for the reason that it mimics effects of calorie restriction. Berberine targets AMP-activated protein kinase (AMPK) or also known as adenosine monophosphate-activated protein kinase activity. This adenosine monophosphate-activated protein kinase activity (AMPK) is an enzyme that functions as a cell energy homeostasis and a metabolic regulator on the intracellular system. This is the reason why berberine has several diverse benefits because of adenosine monophosphate-activated protein kinase activity. Study shows that berberine has the same action of an antihyperglycemic medication specifically the metformin to type 2 Non-Insulin Dependent Diabetes Mellitus. It works as effective as metformin, decreasing the glucose level by improving insulin sensitivity and stimulating glucose uptake. Berberine also decreases the risk of having deadly cardiac problems, by increasing the protein receptors in the liver that binds with LDL cholesterol or bad cholesterol and triglyceride for excretion. As a result, more LDL cholesterol or bad cholesterol and triglyceride will bind to the receptor site, and there will be lesser LDL cholesterol and triglyceride level in the blood stream. Berberine also increases the fat burning mechanism in the cell and stimulates the production of nitric oxide. It acts as a vasodilator, widens the arteries, increasing blood flow and decreasing the fat buildup to the arteries, preventing atherosclerotic plaque. Berberine helps manage fatty liver disease, by reducing the production of hepatic fats that cause injury, malnutrition and even hepatotoxin. Berberine has an antimicrobial effect against fungi, viruses, bacteria, chlamydia and helminthes, through boosting immunity specifically the white blood cells and reducing the bacteria’s ability to bind with the human cell. Berberine has been believed to treat infectious diseases like respiratory infection, gastrointestinal infection and urinary tract infection. Berberine has effects on brains; a recent research study from Shandong University of Technology in China found out that “berberine supplement decreases peptides that inhibits memory function, prevents oxidation damage to the brain, inhibits enzymes that causes break down of essential memory molecule and decreases lipid that inhibits blood flow of the brain.” It has been understood that berberine supplement can potentially help these mental illness; Alzheimer’s disease, schizophrenia, bipolar disorders and depression. Through extensive research, examining and testing animals and human; berberine supplement is proven effective, with standard advisable dose of at least 900-2000mg which is split into three or four doses throughout the day for overall health. It shows that a 1500mg of Berberine, is equally effective as taking 4mg glibenclamide or 1500mg of metformin, two recognized drugs for the management of type II non-insulin dependent diabetes mellitus. Hypogylcemia – especially to a healthy person without diabetes taking this supplement for a long term; hypoglycemia may occur (abnormal decrease of sugar in the blood) because berberine decreases blood sugar if elevated, but to a normal person it could decrease. Gastrointestinal upset – in high dose can cause GI upset like diarrhea, GI cramping and constipation; therefore, berberine should be taken in divided does in a day. Pregnant and lactating women should avoid taking berberine supplement; some study says that it can cause teratogenic effect to the fetus. It has been proven side effects, so it is still a must to consult the physician or with a botanical medicine specialist before taking berberine supplement.